Launched in November 2008, Principal Emerging Bluechip Fund is classified under the diversified equity funds of CRISIL Mutual Fund Ranking of December 2017. It has ranked 1 in the ten consecutive quarters ended December 2017. The fund was reclassified as a Large and Midcap Fund effective from April 23, 2018 in accordance with the SEBI circular dated October 6, 2017 pertaining to Categorisation and Rationalisation of mutual fund schemes. The investment objective of the scheme is to achieve long-term capital appreciation by investing in equity and equity related instruments of large cap and midcap companies. It’s quarter average assets under management stood at Rs 16.57 billion for the March 2018 quarter. Dhimant Shah has been managing the fund since June 2011. The fund has consistently outperformed the benchmark (Nifty Midcap 100 Total Return Index (TRI); based on old benchmark) and its category (funds ranked under the diversified category in December 2017 CRISIL Mutual Fund Ranking) in all the trailing periods analysed. 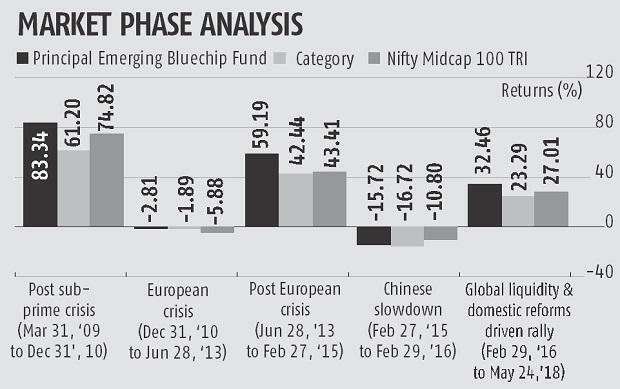 The fund outperformed the category and the benchmark in three of the five market phases since its inception. 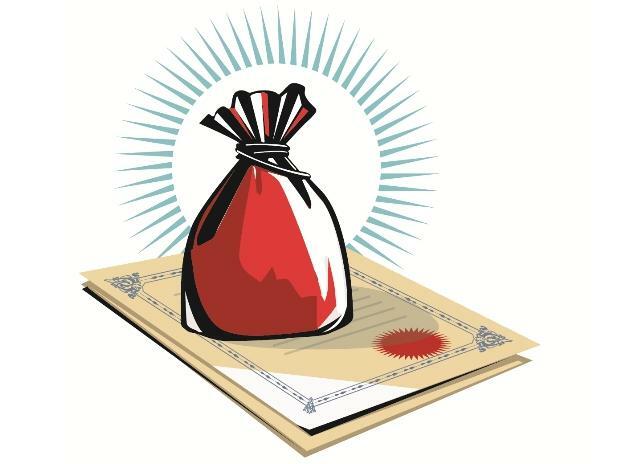 An investment of Rs 10,000 in the fund on November 12, 2008 (inception of the fund) would have grown to Rs 1,06,500 on May 24, 2018 at an annualised rate of 28.16 per cent, surpassing the category and the benchmark which would have grown to Rs 52,787 (19.06 per cent per annum) and Rs 56,874 (20 per cent per annum), respectively. A systematic investment plan (SIP) is a mode of disciplined investment offered by mutual funds to investors through which one can invest a certain amount at regular intervals. 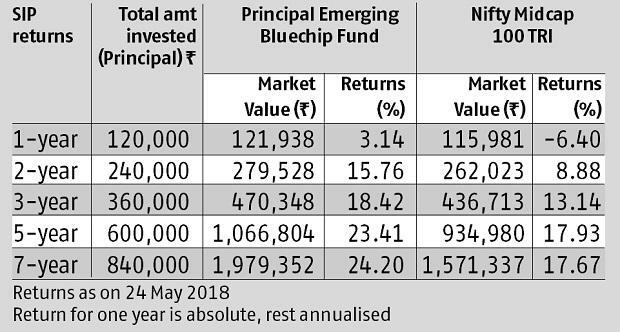 Principal Emerging Bluechip Fund outpaced its benchmark during the past one year; and two, three, five and seven years. During the past three years, the fund has maintained average allocation of 96.16 per cent to equities. The portfolio has been diversified across market capitalisations with large cap allocations ranging from 33.69 per cent to 50.35 per cent during this period. The fund took exposure to 167 stocks during the period under analysis and kept the size of the monthly equity portfolio at average 71 stocks during this period. It took exposure to 32 sectors during the past three years. The top five sectors were banks with average allocation of 12.18 per cent, industrial products (8.41 per cent), auto ancillaries (7.3 per cent), pharmaceuticals (7.28 per cent), and cement (5.65 per cent). IndusInd Bank was the highest contributor to the fund’s performance from the banking sector. Mold-Tek Packaging was the best contributor from the industrial products sector. MRF was the top contributor among auto ancillary stocks. Natco Pharma and Shree Cement were the top contributors from the pharma and cement sectors, respectively. The fund reduced allocation to the pharma sector from 10.92 per cent in August 2015 to 3.38 per cent in April 2018. During this period, Nifty Pharma TRI declined 30.62 per cent (absolute), while the broader Nifty 500 TRI grew 46.77 per cent (absolute). Allocation to the software sector declined from 4.2 per cent in March 2016 to 2.33 per cent in April 2017. During this period, Nifty IT TRI declined 10.11 per cent (absolute), while the broader Nifty 500 TRI grew 29.03 per cent (absolute). Subsequently, allocation to software stocks was increased from 2.33 per cent in April 2017 to 5.57 per cent in April 2018. This period witnessed recovery in the IT sector. Nifty IT TRI returned 43.17 per cent (absolute) compared with 17.01 per cent (absolute) by the broader Nifty 500 TRI. Over the past three years, the fund has consistently held 24 stocks, accounting for average exposure of 37.97 per cent. Of these, 12 stocks outperformed the fund’s benchmark during three years. Among the consistently held stocks, Eicher Motors, Britannia Industries, IndusInd Bank, Mold-Tek Packaging and Shree Cement were the top contributors to the fund’s performance.